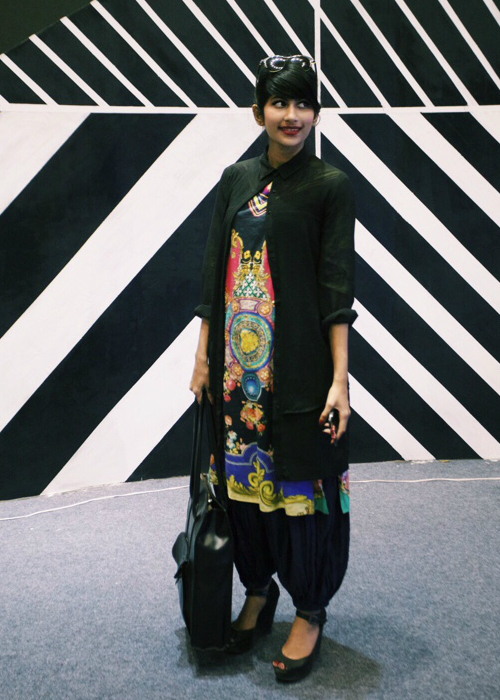 How To Style Indian Wear To Work: Top Tips From Team POPxo! Wearing ethnic to work can be tricky, but if done well, it can be a total hit too! The only thing we need to keep in mind is how to balance the blings and colours with the appropriate amount of skin! Dressing up in those lovely kurtas, palazzos and sarees sometimes can be so refreshing, and it definitely looks pretty! Especially with a dash of kohled eyes, danglers, and that tiny bindi! We love to wear the fusion versions to work since they are the most comfortable and airy! 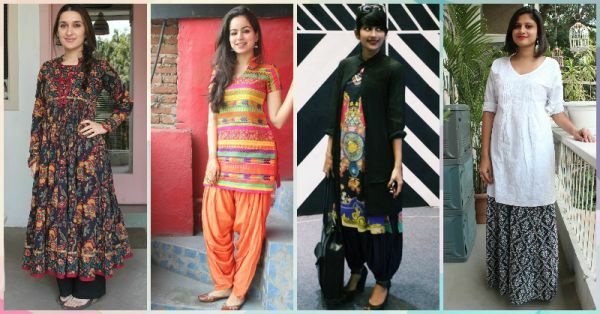 Here are some ways in which members of Team POPxo style their Indian wear to work and make them look so so gorgeous! Pradipta Sarkar, Associate Editor When it comes to Indian wear, a sari is the epitome of timeless grace and beauty. Our Associate Editor wears her gorgeous sari to work, and does justice to it in every way. She carries it with off with ease and her lovely crimson blouse makes her look just classic without being too loud. Take notes from Pradipta the next time you decide to wear a sari to office. Dakshee Haryani, Social Media Coordinator Dakshee looks vibrant in this short, multicolored kurti that she has paired well with the orange patiala and those jutis. To add a bit of zing, she’s wearing tiny jhumkis which blend well with the outfit. She manages to look bright but still keep the overall look subtle! Too good, we say! 3. THAT Mysterious Print Though! 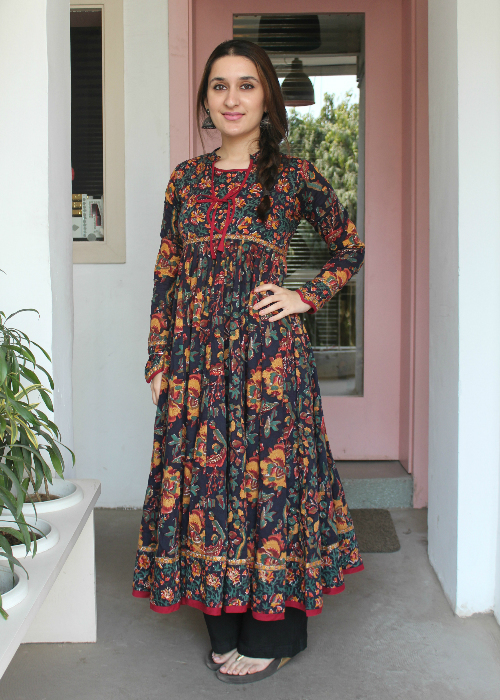 Simar Rana, Lifestyle Editor Simar looks stunning in this black anarkali! We especially love the red solid patti on the hemline and the neck tie up, it just brightens that print. The overall pattern is so intriguing that it makes us delve more into those deeply intricate motifs. She has finished off the look well with a pair of straight pants and delicate, black jhumkis! 4. The Half And Half! Tanaya Seth, Editorial Coordinator Tanaya has cleverly decided to wear this half brocade embroidered jacket with a pair of jeans. She usually wears this with shararas or skirts, but here she has matched it with skinny jeans and a subtle pair of gold slip ons! She’s kept the accessories minimal, wearing nothing besides that gold kada and her watch! 5. The Chikankari And Print Magic! 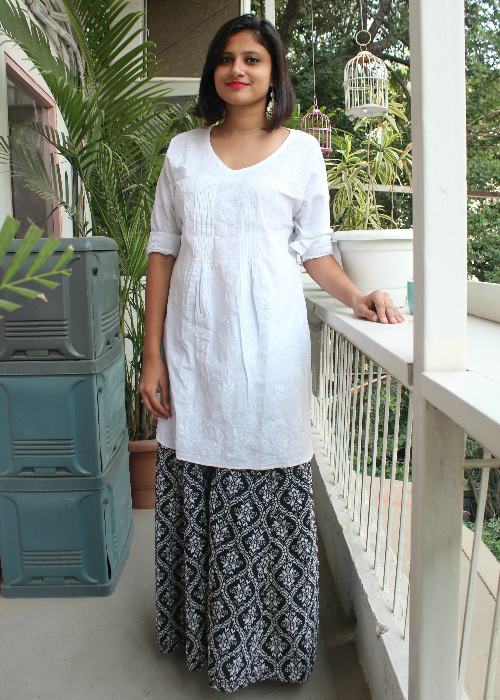 Kritika Rathi, Fashion Writer I love Chikankari kurtas and this one is my special favorite. I have paired it with a pair of black and white printed palazzos, which have that extra volume. I’ve finished the look with ultra light gold and pearl danglers for which I always get compliments! When I wore this, the whole day I felt so relaxed and comfortable that I would wear it again and again! 6. The Modern Indian Version! Gopika EM, Social Media Manager Gopika likes to merge her Indian with her western favorites! 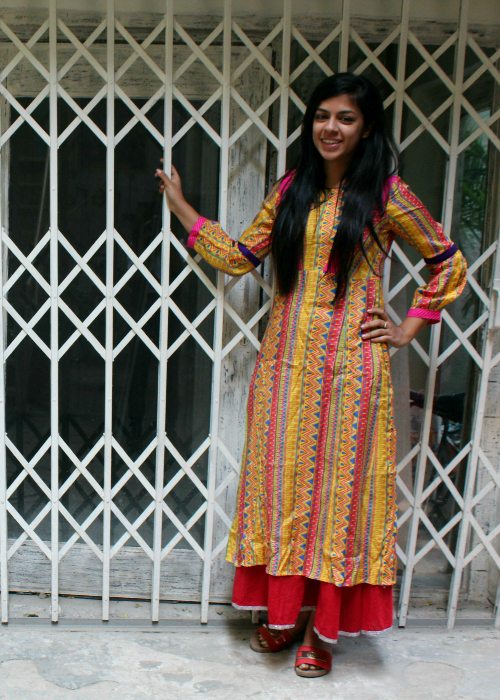 She’s put on this quirky printed kurta with ankle-fitted harem pants. She’s wearing comfortable wedges and that jacket over it to complete the look! A classy ensemble for work, we are surely taking a lot of inspiration from this one! Manasvi Jaitly, Wedding Writer White and indigo make for such a beautiful duo that we absolutely want to get our hands on some! Manasvi looks radiant in this applique kurta which complements the cobalt blue palazzos and that indigo block printed dupatta. Perfect for a day look and a long day at work. Just add a hint of sheen with those sweet earrings! 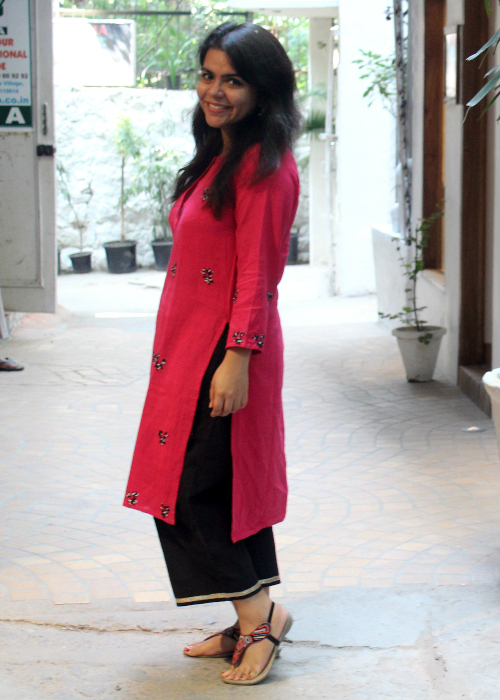 Avisha Chaudhary, Social Media Coordinator Avisha does kurtas as well as she styles dresses! 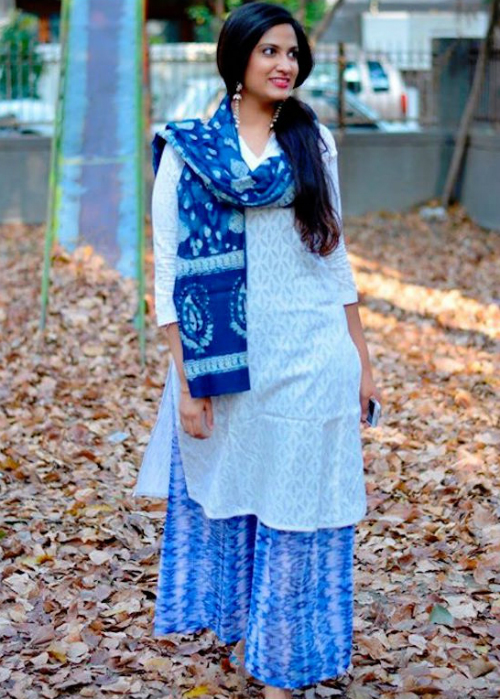 Looking beautiful in this kalamkari kurta, she inspires all of us to go pick the most traditional kurtas in our closet and wear them as flawlessly as her! The solid stole, the straight white cotton pants, the silver earrings and that bindi, ufff! We LOVE this look! 9. The Simple, Sweet One! Mohina Chadha, Audience Insights Analyst Mohina is wearing a simple desi printed sleeveless kurta which compliments her so nicely! She has gone for the standard comfortable look with black leggings and regular ballet flats. This look is for the girl who doesn’t want to accessorise too much and keep the look no-fuss! We raise our glasses to the laidback yet pretty vibe! 10. The Time-Honored Red And Black! 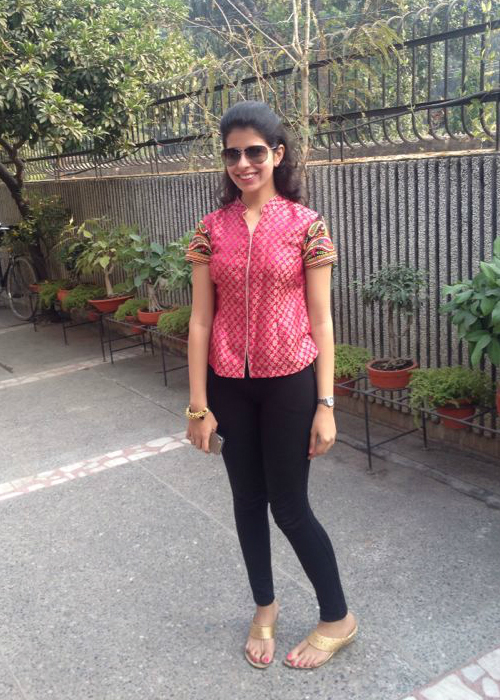 Anusha Raheja, Senior Social Media Manager This age-old winning formula of red and black looks amazing every time! 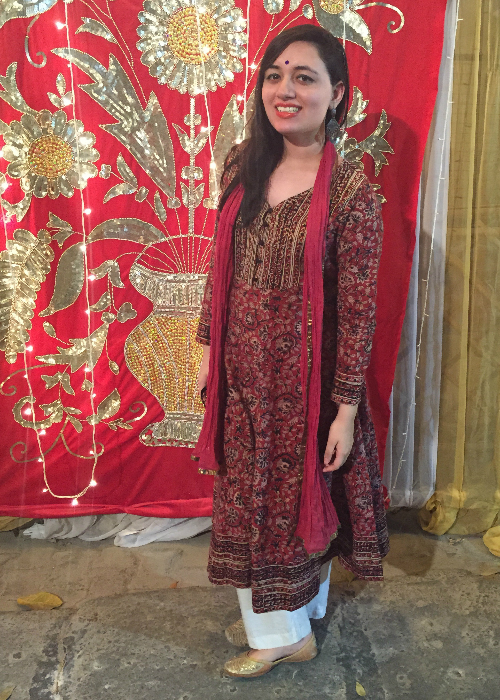 Anusha has paired her graceful red kurta which has tiny applique bootis all over with ankle length palazzos. Her sandals with those red and white and black beads marry so well with the whole look that we wonder if they were customised? 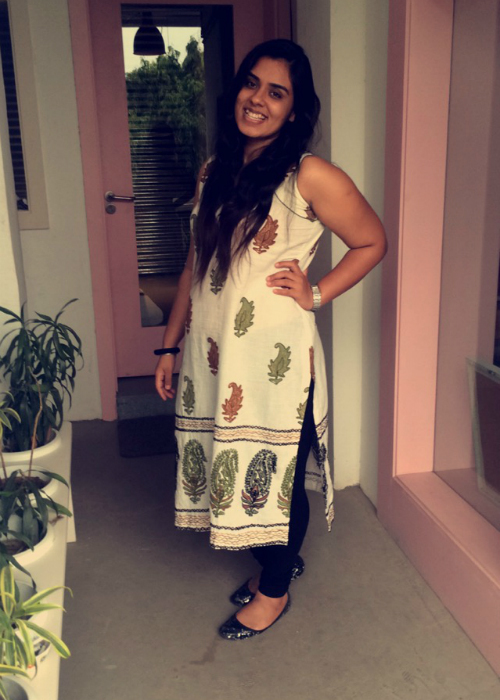 Ragini Kapoor, Account Manager Ragini wears long kurtis very often to work. She usually wears flowy palazzos with them! Here, she’s wearing a bright printed kurti with an even brighter pair of red palazzos! Those tiny streaks of color - like the pink and the silver hemline -makes this a delightful look... Perfect for days you need to perk your mood up and keep that tempo going! 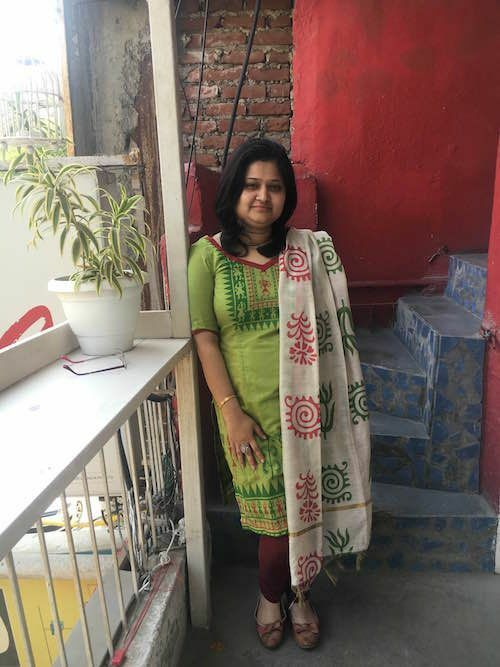 Parul Budhkar, Associate Editor, Hindi Our Hindi Associate Editor, Parul, wears a classic kurta-set to work and just defines elegance. Comfortable and poised in her green cotton kurta, she knows how to wear the traditional suit to match the working environment. She pairs it with beige ballet flats and keeps her accessories minimal in this ensemble. 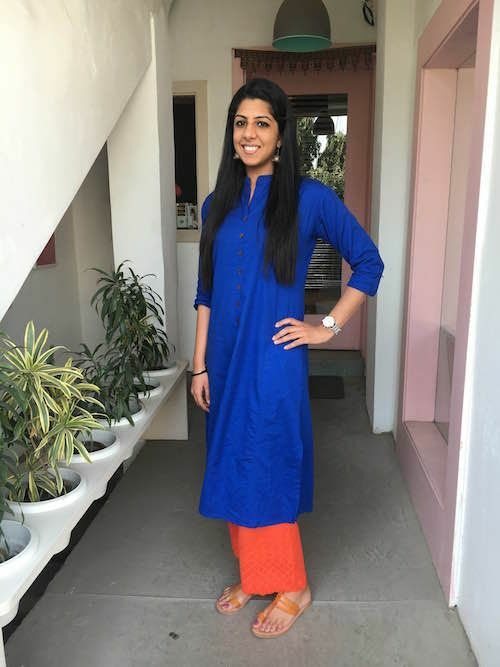 Samridhi Bhutani, Quality Assurance Engineer Vibrant blue teamed with the most delicious orange gives you a colour combination and an outfit to die for! Samridhi shows how us to take colour blocking to a whole new level. She brings some sunshine to work with a flawless combination of the long blue kurta and orange palazzos. To finish off the look, she wears the classic Kolhapuri sandals and small jhumkis. MUST-READ: The MOST Stylish Sunglasses? Team POPxo Reveals Their Favs! MUST-READ: What Are The BEST Jeans Brands? Team POPxo Reveals Their Favs!